If malware prevents Avast Antivirus from running a Boot-time Scan, you can run Windows in Safe Mode and use the Boot-time scan scheduler. 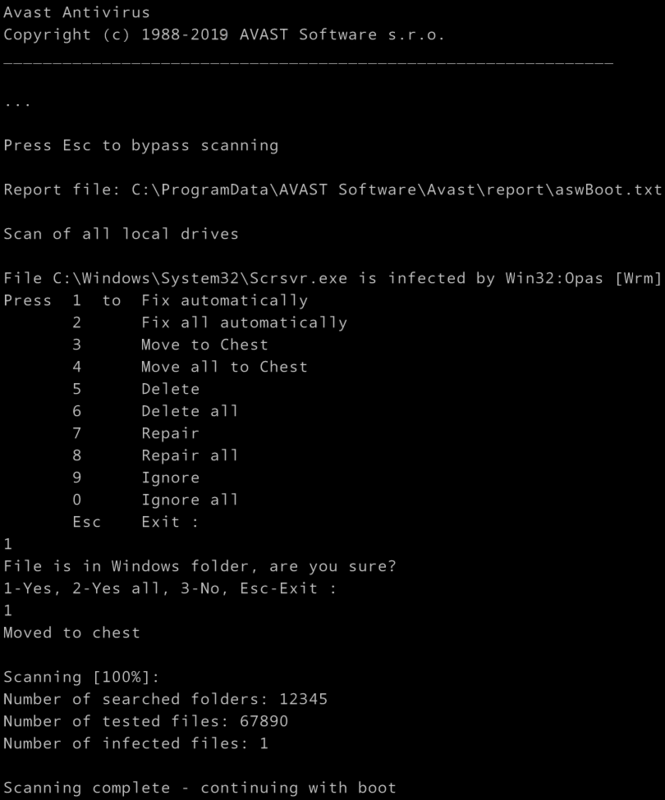 In the Command Prompt window, type the CD command and the location of your Avast installation file (C:\Program Files\Avast Software\Avast by default), then press Enter ↵. If typing the default location does not work, you may have saved your Avast installation file to a different location. Type the CD command followed by the location where your Avast installation file is saved and press Enter ↵. Type the sched /A:* or sched.exe /A:* command, then press Enter ↵ to schedule a default Boot-time Scan of all local drives on your system. To view all command line options, type sched or sched.exe, then press Enter ↵. When the Command Prompt dialog indicates that the Boot-time Scan is scheduled, type shutdown /r, then press Enter ↵ to re-boot your computer to run the Boot-time Scan. After your computer restarts, a Boot-time Scan progress screen appears as Windows begins loading. For any detected threat select which action to take. The scan usually takes several minutes but the duration varies depending on the speed of your system and the number of files to be scanned. When the scan is completed or skipped, Windows continues booting up. To skip the scan, press the Esc key on your keyboard.